Today is the 5th anniversary of the death of Theo van Gogh. He was a Dutch film director who worked with Ayaan Hirsi Ali on the film Submission. The short film investigates violence against women in some Muslim societies. The script was written by Ayaan Hirsi Ali who was involved in social work amongst abused Muslim women in Europe. After the film’s screening van Gogh and Hirsi Ali received death threats. 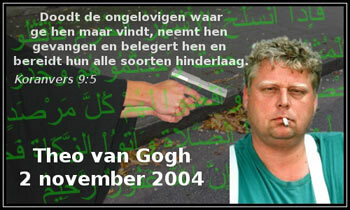 On November 2, 2004, Van Gogh was murdered by Mohammed Bouyeri. Bouyeri shot him eight times, cut his throat, nearly decapitating him, and stabbed him in the chest. A five-page note threatening Western governments, Jews and Ayaan Hirsi Ali was attached to Van Gogh’s chest with a knife. Since that time Ayaan Hirsi Ali has been under constant guard, and moved to the USA for some time. Bouyeri is currently serving a life sentence. Ayaan Hirsi Ali wrote the book Infidel – I can highly recommend it. Brought up a Muslim she is now an atheist. Currently she is writing a fictional book where Mohamed is confronted by some well known Western enlightenment intellectuals. Should be good.